Reviewed by Alex Vormbrock (a.k.a. Herr Schatten). In the last few years we got pretty much used to getting one "last" Dreamcast game after the other. 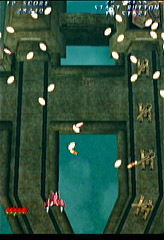 Practically every shooter released on the Naomi arcade platform was ported to Sega's little white box straightaway. So understandably, the excitement over Triangle Service's announcement of a DC port of their 2004 arcade game was somewhat limited. Triangle Service was still a fairly young company, which had produced only one shooting game before. Said game, XII-Stag, featured some play mechanics of the slightly idiosyncratic kind, so naturally it polarised. Some people really seemed to like it, but just as many players hated the game with a passion, while the vast majority of the gaming crowd largely ignored it. 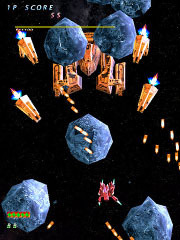 Without a great track record from previous works to boost Triangle Service's reputation as a developer and with the scepticism the lukewarm reactions to XIIStag had brought with them, Trizeal wasn't exactly the game people were craving to play, and, in fact, when it appeared in the arcades, it seemed to be doomed to share the grim fate of its spiritual predecessor. Much to the surprise of everyone at Triangle Service, but not at all to anyone else's, Trizeal became amazingly unsuccessful. (There are plausible reasons for its failure in the arcades, but I'll talk about those later.) It actually brought the young company on the verge of bankruptcy. 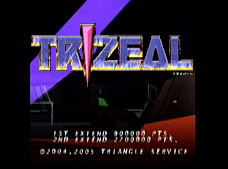 The last hope of keeping Triangle Service afloat was the DC port of Trizeal. So the company posted an SOS note on their website, in which they literally begged the shooting game fans to buy their product. You probably have heard of this before, so I won't go into detail here. The only reason why I tell you all of this is that the review would just have felt incomplete without it. But now let's forget about it completely. Let's talk a bit about the actual game instead, shall we? The first thing you'll notice when you fire up Trizeal on your DC is that the graphics are really not something to write home about. XIIStag featured some excellent 2D artwork, but you won't find anything like that in Trizeal. Instead, you have to face 3D graphics whose polygon count always seems to be just below the level that would have made them look good. Most of the backgrounds and textures look okay, the ship models are nice despite being somewhat boxy and the choice of colours is quite beautiful most of the time. 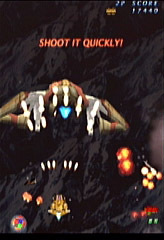 However, other parts of the game, namely the title screen, the intro sequence and the stage 4 boss, are downright ugly. So overall, the graphics in Trizeal would have been decent for a PS1 game, but for a DC game they are pitiably sub par. They do the job, but you will probably never be wowed by them. The only exception is the impressive screen-filling boss explosions, which look simply amazing. The graphics are certainly a key factor in the game's failure as a coin-op machine, especially since the attract mode of Trizeal is one of the worst I've ever seen. I don't know if I had even thought about putting a coin into a Trizeal cab when right next to it flashier games had been trying to get my attention. That's human nature. Life is unfair. Let me talk about the sound effects and the music next, as slowly we're approaching the bits Trizeal is good at. 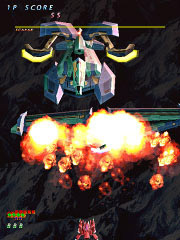 While, like in most shmups, the sound effects are not very noteworthy, they do the job well and some of the bigger explosions go off with a satisfyingly room-shaking boom sound. Nice. The music is run-of-the-mill techno-y stuff, pretty much exactly what you'd expect from a shooter released in the early 2000 years. 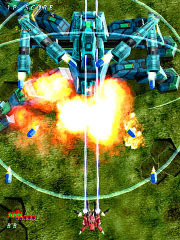 It makes me miss the times when music in a shmup wasn't just something to fill the silence in-between the shots and explosions, but instead something that made your heart go faster. There's nothing particularly wrong with Trizeal's music, it's composed and executed well and for the most part accompanies the mood of the stages just fine. It's even hum-able at times, but it's in no way outstanding or even the least bit exciting. The themes of stages three and five in particular are just a tad too laid-back to qualify as great shmup tunes. The stage four theme, on the other hand, is actually quite catchy and has that certain extra spice most of the other tracks lack. It's easily understandable why this particular track was chosen to be remixed (with added singing by AvantGirl, an obviously talented Japanese singer) for the bonus audio CD that comes with the DC version of the game. Overall, the music of Trizeal is fine, but due to its nature, you might want to hear it outside the game rather than whilst playing it. It doesn't feel out of place, though, so I better stop complaining that Trizeal doesn't have the kind of music I prefer. If the type of music appeals to you, you will find it more than decent, if not, the music won't annoy you, so I guess everything is alright with it. It's just nothing special. Saving the best for last, I want to tell you about the game play next, as this is where Trizeal really shines. The game's play mechanics are pretty simplistic (not to be confused with 'simple'), but are still fit to build a satisfyingly deep game around. In addition to the d-pad you use to control your wee spaceship there are three buttons which are important to the on-screen action: shot, bomb and transform. The first two are self-explanatory, the latter makes your ship transform into one of three shapes. With the shape shift comes a change of your primary weapon. There are three weapon systems between which you can switch anytime: wide, laser and missiles. The wide shot is your Raiden-esque spread Vulcan, which is fairly powerful, especially when you point blank enemies with it. The laser fires a straight and narrow beam. It is the weakest weapon of the three, but it has piercing abilities which allow you to hit enemies hidden behind obstacles or multiple enemies at the same time (if they are vertically aligned, that is). The missiles are homing missiles. They are the most powerful weapons, but their firing rate is very slow. Every weapon has its use in certain scenes and the game encourages you to strategically switch to the appropriate weapon accordingly. 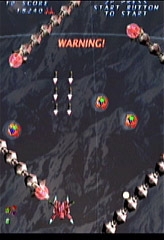 Each weapon starts at level one and can be powered up four times until it reaches level five. To make your weapons' power go up simply collect the power up icons shot enemies drop once in a while. The power up icon will always improve your currently selected primary weapon, never the two inactive ones. If a weapon reaches at least level four, it stays around as a secondary weapon, although reduced by three levels, when you switch to another one. Thus, when you're fully powered up, you can fire one weapon at level five and two at level two each at the same time. This results in impressive screen-filling, almost Batsugun-ish firepower. Interestingly, the ship on the 2P side has slightly different specs. Sadly, I can't recommend playing Trizeal with a friend, because the game suffers from some serious slowdown in 2P mode. Fortunately, the slowdown is a non-issue in 1P mode. Trizeal has a simplistic, yet addictive, score system. Shot enemies drop medals. Those start at a value of 10 points. Every time you collect another medal their value will increase until it peaks at 1,000 points. When you miss a medal, the value goes down to 10 again. The progression of the medal chain is solely dependent on the number of collected medals, not on their value. So grabbing a higher value medal to save your chain Giga Wing style won't work in Trizeal. In addition to the score you get from chaining medals you also get a huge end-of-stage-bonus which is dependent on your shot down ratio. If you manage to destroy all enemies in a stage (thus obtaining the 100 percent shot down ratio) you receive a special bonus. The stage design of Trizeal is superb. Unfortunately, the game is a slow starter, which might be another reason for its failure at the arcades. Trizeal's qualities are not very apparent at first. Instead, Trizeal lures you into thinking that the game is quite easy, but you'll soon discover that it isn't. It isn't quite the brutal onslaught your average manic Cave shooter is either, but it presents a nice and intense challenge without getting too frustrating. In certain key spots you can open up hidden subsections of the stages which hold particularly nasty enemies. All the stages are stuffed with nice little touches, homages and secrets to discover and there are many scenes that are quite imaginative and haven't been done before in a shooter. The stage design is very varied and presents a nice blend of old school-type aimed shots and modern pattern-based attacks, overall giving the game an early- to mid-nineties transitional feel. Think DonPachi, Rayforce or Shienryu and you'll know what I mean. The Dreamcast version comes with several hidden bonuses. If you desire to do so, you can play the game using the ships from XIIStag and there are an omake stage and a mini game to be unlocked. If that sounds at least a bit appealing to you, I strongly suggest giving Trizeal a spin. Once you get over the sub par graphics you'll find a finely crafted game that doesn't get quite the attention it deserves for its great game play. Easy to get into, not quite as easy to master. An underrated gem and a welcome change from the manic shooters which are so popular nowadays. Of the following screenshots, the first, third, fifth, seventh and eighth one appear with kind permission from Ivan Mecking of segacollection.com. The others were nabbed from the Trizeal page at segadirect.co.jp. I hope they don't mind me using them. If you manage to destroy all of the waves of purple ships, a bonus scene with additional enemy formations will be triggered. Here we are as things are starting to get interesting in stage 1. Don't let any of the ships escape to get the 100 percent shotdown ratio at the end of the stage. This is the boss of stage one. Not too difficult, actually. Hint: Use the laser to destroy the little cannons on the wings before you go for Scarab's main body. These steel dragons are the bonus enemies you get for clearing the "Break Out!" scene. They shoot nasty patterns and it's quite tricky to destroy them all. Hint: You won't get hit if you stand perfectly still. One of the more spectacular bosses in the game. It can be quite tricky if you don't have a good strategy . In the upper middle part of the screen you can see some sort of android standing on the ground. After the two towers are destroyed, he will throw a rock up in the air. Try to catch it with your ship and keep it in the air as long as possible. You can rack up huge scores by doing so. 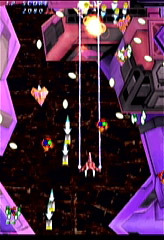 This scene is also included as a mini game (with its own highscore saves) in the DC version. 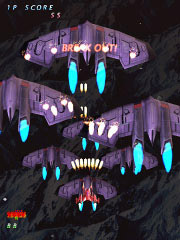 One of the greatest shmup traditions (besides snakelike enemies and fire/ice levels) is the mandatory giant battle ship assault in stage 3 of a game. Trizeal delivers as expected. The fourth boss is quite tough. Don't be reluctant to use a bomb here. It will get rid of all the floating gunpods at once. 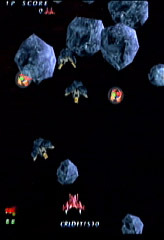 The asteroid field is one of the scenes dreaded by almost every Trizeal player. Enemies are hiding inside the rocks and everything can get quite a bit hectic. Hint: Switch to the vulcan to produce more slowdown. It will make surviving a bit easier.